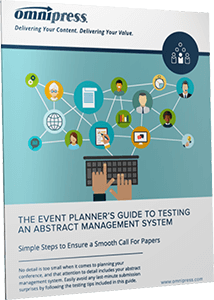 Learn The Best Way To Organize And Test Your Abstract Management System In The Least Amount Of Time. No detail is too small when it comes to planning your conference, and that attention to detail includes your abstract management system. Easily avoid any last-minute submission surprises by following the testing tips included in this guide. Use the included checklist to stay organized as you conduct a thorough system review. How to develop an efficient testing plan. Whom to recruit to help with your tests. How much time you’ll need to complete the test. How to track your progress and stay organized.